Home › Snapchat Today › What Does the Purple Wave Next to a User’s Name on Snapchat Mean? What Does the Purple Wave Next to a User’s Name on Snapchat Mean? If you have many friends on Snapchat, there is a good chance you have noticed the purple “wave” next to some user’s names. This shows up right beside their Snapchat score. A large number of users have asked us what these purple symbols mean. These are the signs of the zodiac which are determine by someone’s birthday. If you see the purple wave it means they are an Aquarius and were born between January 19 – February 18. 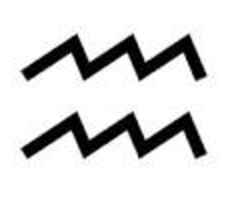 Note that this is the only symbol for the signs of the zodiac that looks like a wave. Some of the other symbols are very similar. Why are Boys Posting the #13 on Snapchat in March 2017? | What Does the Purple Sideways 69 Next to a User’s Name on Snapchat Mean?